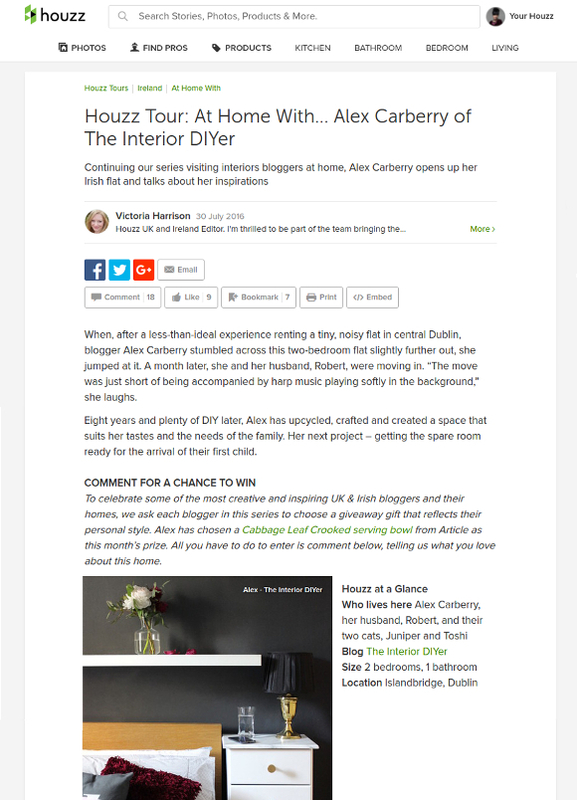 The Interior DIYer featured on Houzz + a giveaway! Much excitement was had over the weekend as an exciting feature for me went live on Saturday morning; back in early June I photographed our apartment to be featured as a Houzz UK and Ireland home tour. Much pinching. Big wow. 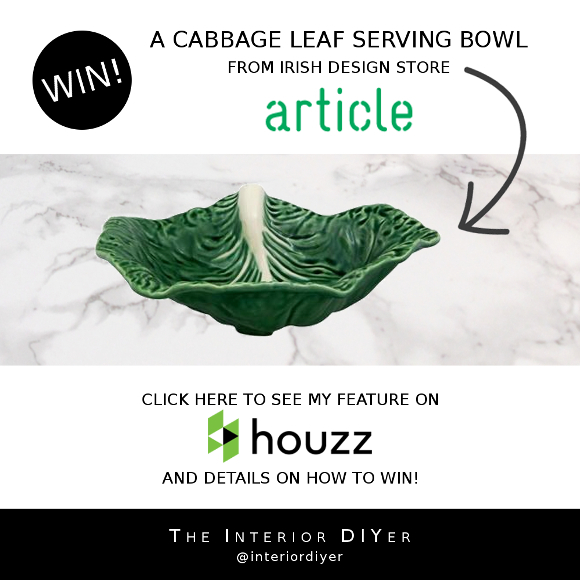 Not only that, but alongside the feature of our apartment, Houzz UK and Ireland are running a GIVEAWAY where you can be in with a chance of winning a beautiful cabbage leaf serving bowl from one of my favourite Dublin design shops, Article! 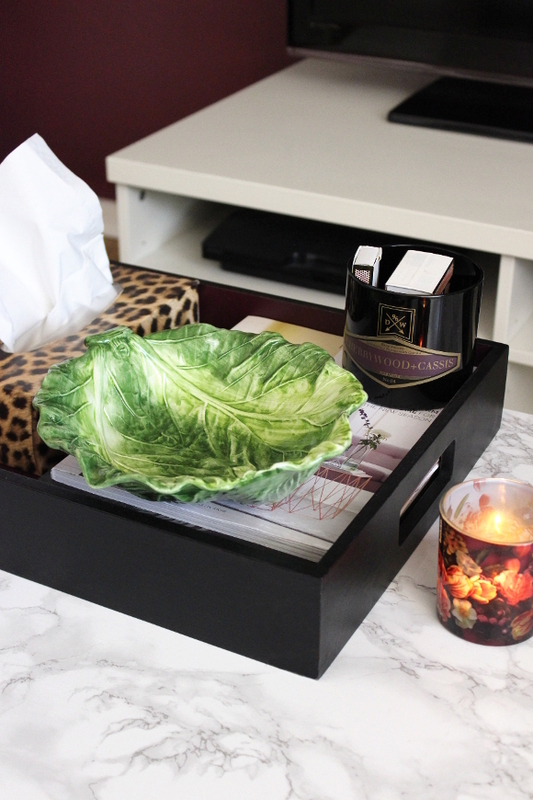 It’s very similar to my own beloved leaf bowl which was gifted to us by my parents after their last holiday. CHECK OUT THE FULL FEATURE AND GIVEAWAY HERE! I’m not sure about where you are, but today the weather in Dublin is fifty shades of meh. 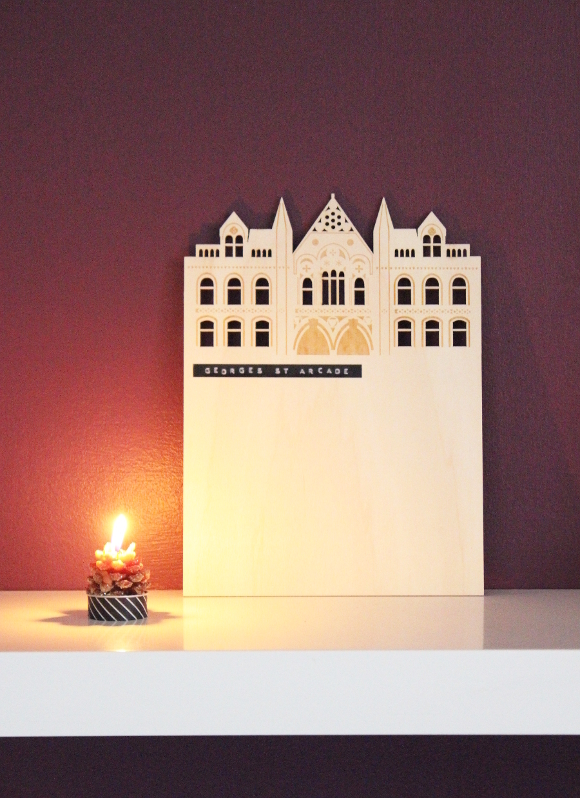 In an effort to cheer up my afternoon I thought I’d share this amazing laser cut wood silhouette of George’s Street Arcade by Alljoy Design that I spied in Jam Art Prints last weekend. It’s not often that I see something and immediately have to have it [I usually think about something a lot before buying it, even if it’s a pair of tights], but I actually had to have this piece. 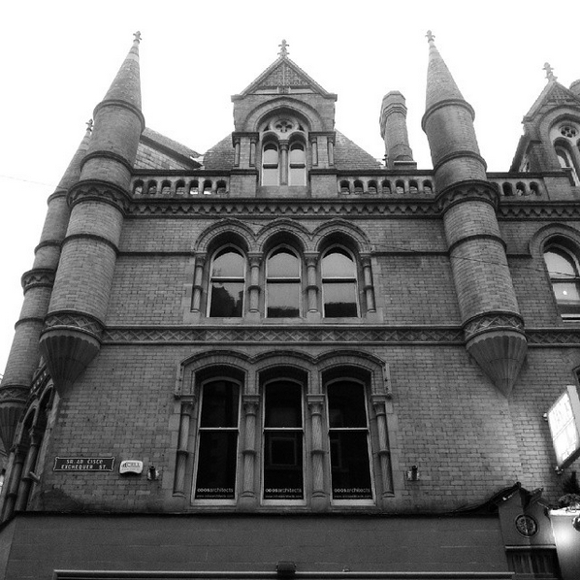 The George’s Street Arcade is one of my favourite buildings in Dublin City Centre and even though I’ve passed it regularly for close to 12 years I still stop, stare and dream about living up among the turrets. 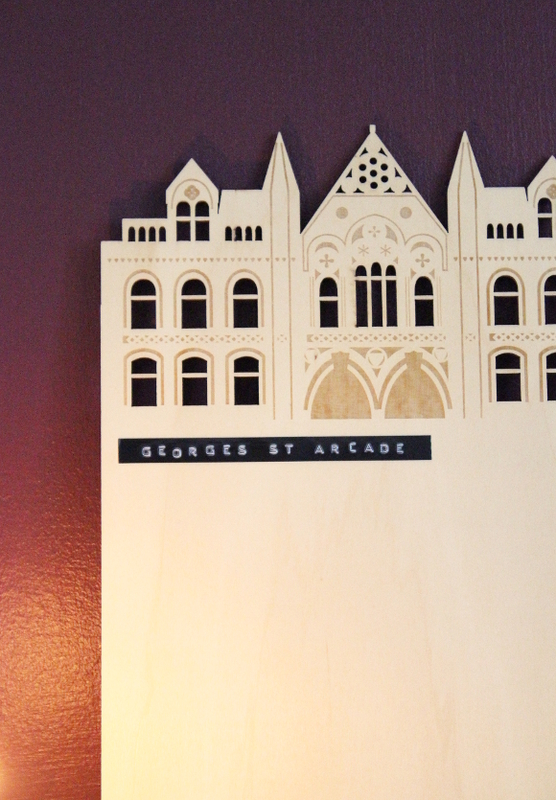 This laser cut representation is so beautifully detailed and perfectly reflects just how amazing the Arcade is. 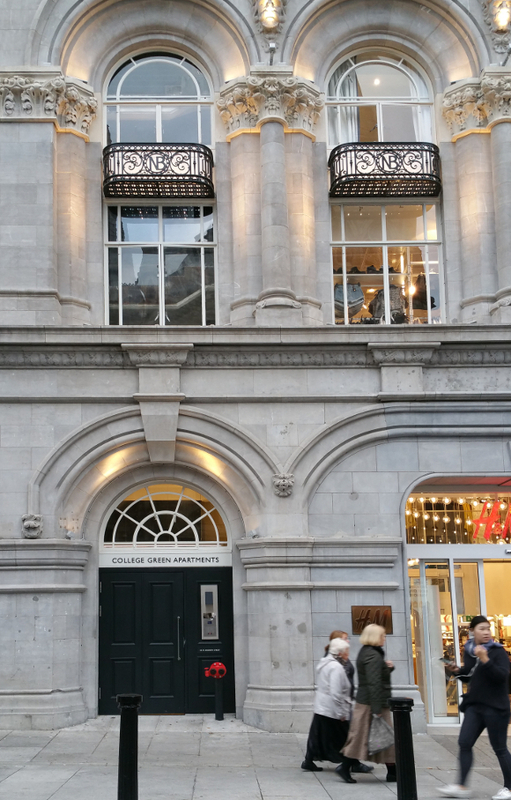 I wasn’t too keen on the font that was used for the engraving across the front so I covered it with a piece of Dymo that says the same as underneath [the engraving says George St Arcade but the correct name is George’s St Arcade]. I’m sure that’s me being pedantic, but I can easily remove the label if I change my mind or if a sweltering level of guilt hits me. There’s of course the option to frame this piece but I quite like how it looks perched on our living room shelf against the dark walls. I’m very glad to have this quirky piece added to our embarrassingly small collection of artwork, but I’m working on it! 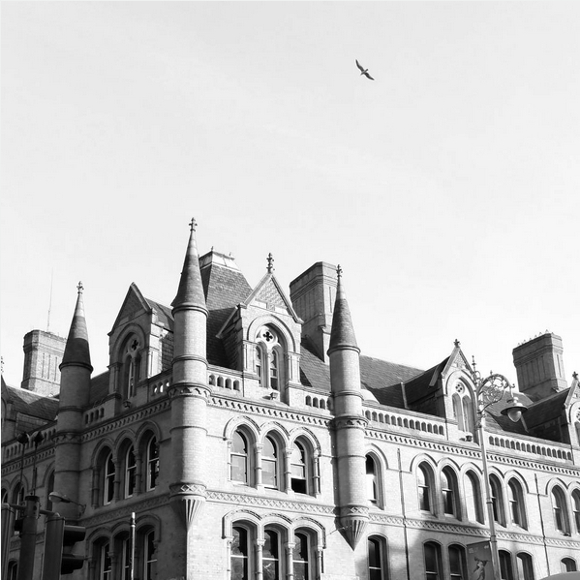 This past weekend Dublin played host to its 10th annual Open House Dublin where, as you can probably guess by its name, buildings across the city that are usually closed to the general public are open with guided tours over 3 days. Most of the tours happened in the city centre, but for the most part we decided stayed local. 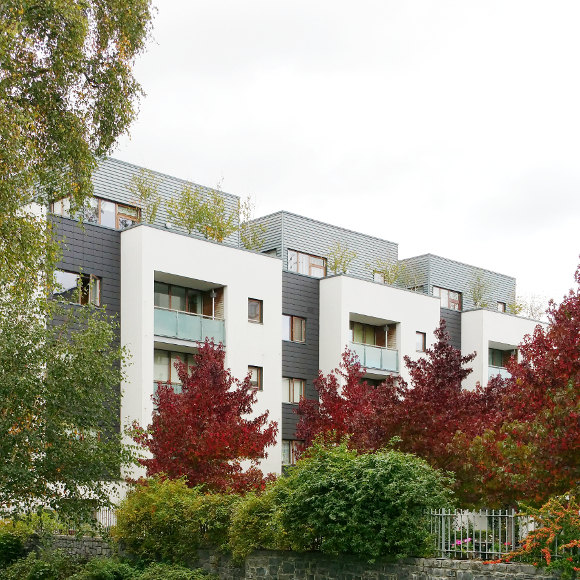 On Saturday we started with the Memorial Court / Islandbridge Court / Sarah Place tour which consisted of three local housing schemes [above is Memorial Court which is home to 66 apartments for senior citizens]. Robert and I pass all three buildings on a daily basis so it was interesting to walk around the grounds and be able to be a tourist so close to home. 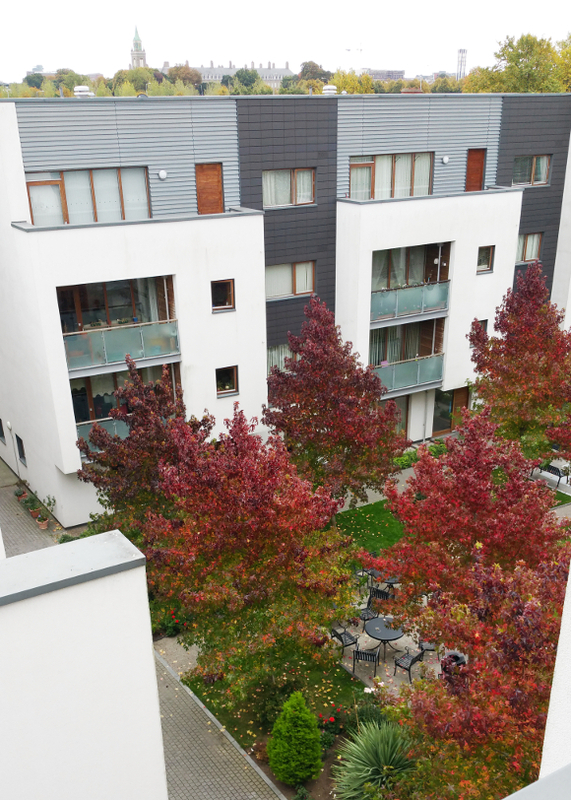 From there, we hopped on a bus and headed into the city centre [where the majority of the Open House Dublin tours were] to check out the College Green Apartments. Unfortunately, after standing in line for almost an hour we were told the queue ended with the woman standing directly ahead of us. I was dying to see the recently refurbished apartments [you can see here] so I could daydream about owning one and feel horrible about my own life in general. I suppose in the long run, they were saving me from myself. Silver lining? The original schoolhouse [which I failed miserably to get a decent picture of. It’s a beautiful building] was built in 1853. 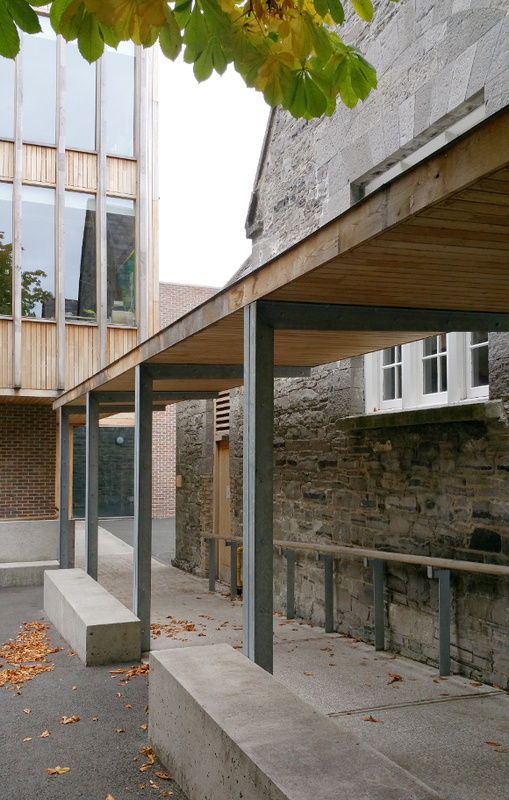 Due to population demand it became necessary for additional space to be added to the school, so in the back corner of the grounds a 3 storey building was constructed to house 6 extra class rooms and a hall [aka, gym] on the ground floor. With huge chestnut trees on the property and a public park across the road, the area doesn’t feel as stark as my pictures may portray. 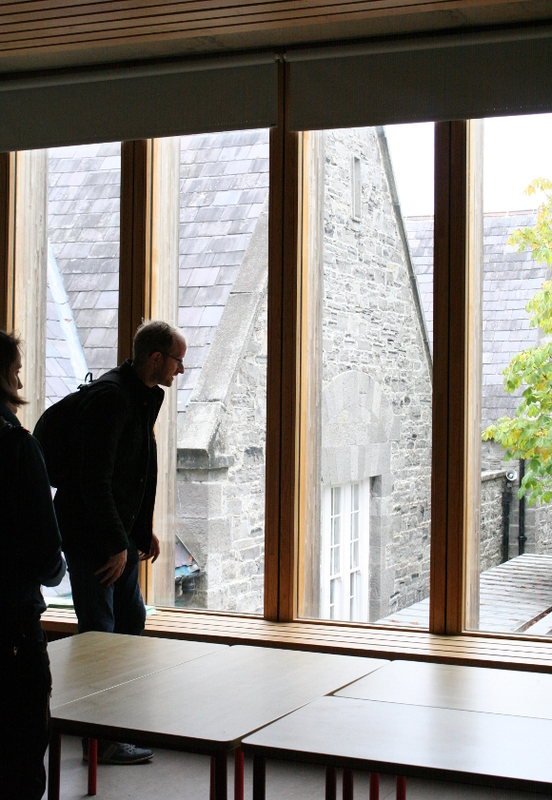 One of the architects gave us a thorough tour of the premises and it was a real treat to learn more about a place I’ve been eyeing for so long. I mean, look at that view from the classrooms … Robert and I literally died. 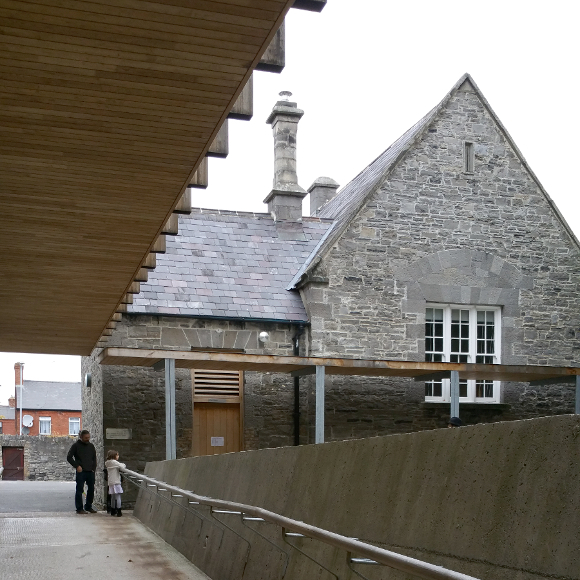 It was a bit of a shame that out of the 5 buildings we visited [3 in Islandbridge, one on College Green and Inchicore School], we only got into one building. 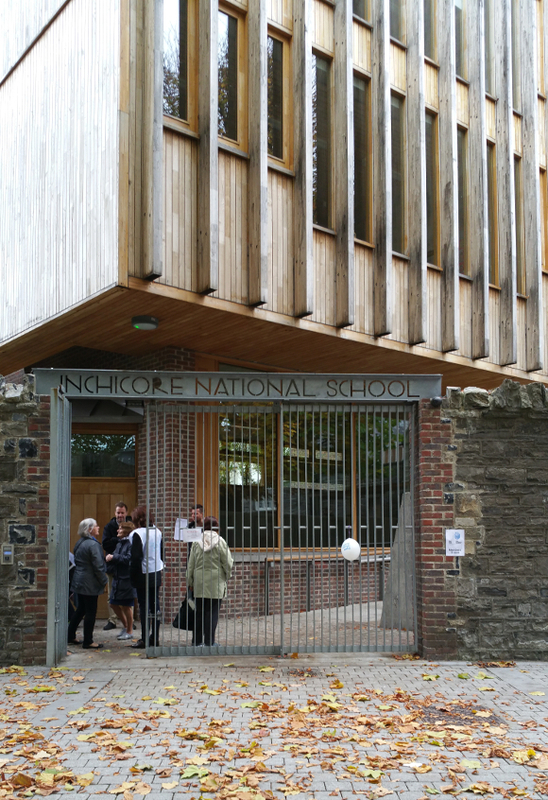 Inchicore School was a real treat and such an inspiring restoration job coupled with an environmental and well-being-conscious new build. It was a lovely weekend exploring in our own backyard. Next year we’ll sure to get out and see more. MOAR!